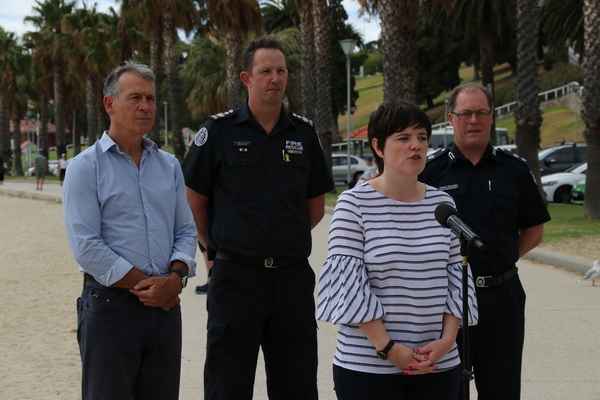 FIRED UP: Crime Stopper's Caroline Reid launches a fire prevention campaign at Eastern Beach with Geelong Mayor Bruce Harwood, CFA assistant chief officer Rohan Luke and Acting Superintendent Trevor Cornwill. Crime Stoppers is aiming to stamp out arson and hot-coal littering in its latest campaign to prevent fires over summer. The organisation launched its Reckless Fires Cost Lives campaign at Eastern Beach on Monday following reports of visitors leaving hot coals from illegal barbeques in the area. Crime Stoppers’ Caroline Reid warned that unintentional fires could result in serious consequences. “Both recklessly and deliberately lit fires are considered arson by law,” she said. Eastern Beach Reserve had seen an increase in illegally-lit coal barbeques this summer, according to Geelong Mayor Bruce Harwood. “Not only are we seeing an increase in groups and individuals illegally lighting these BBQs, often they are not being extinguished properly, which puts the community at risk of preventable fires,” he said. Offenders could face up to 15 years in prison and $36,000 in fines for recklessly lighting fires, Acting Superintendent Trevor Cornwill warned. “Reckless fires cost lives,” he said. Supt Cornwill urged anyone with information on offenders recklessly or deliberately lighting fires to phone Crime Stoppers on 1800 333 000, or triple 0 in an emergency. “We need your help to keep the community safe from bushfires this summer by being aware of your own fire behaviour and that of others,” he said. CFA, City of Greater Geelong and Victoria Police joined Crime Stoppers at Eastern Beach Reserve for the campaign launch.